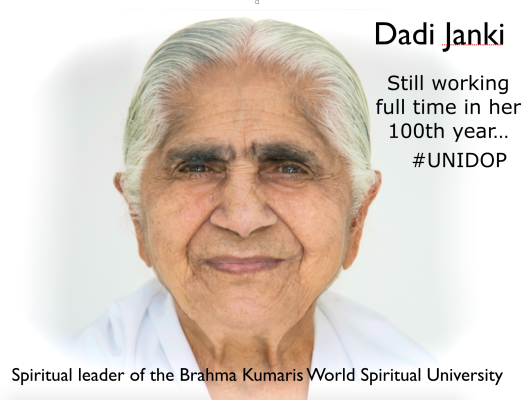 Dadi Janki, now in her 100th year, and who will celebrate becoming a centenarian in January 2016, is actually still working full-time. I find that incredible. Her passion for what she does not only keeps her working but also on the move. This year alone she has so far clocked up 49,418 business air miles. In a world of huge challenges and great change, the wisdom that Dadi (which means Elder Sister in Hindi) can offer seems to be much in demand. Her daily routine starts at 4.00 am with a schedule packed full of meetings with both students of the organisation (Brahma Kumaris World Spiritual University) as well as leaders from business, government and all walks of life. Today the UN is celebrating International Day of Older Persons with this year’s emphasis being on age inclusiveness in the urban environment. It’s estimated that by 2050, people over 60 will account for one quarter of the urban population. So in an era when old age is often seen as a burden (on the taxpayer, healthcare system and social care) and we don’t expect people to work and be economically active in their later years (hence the free bus passes etc for the over 60s!) the question about when to retire is an important one. What do you base your decision on? The need to earn money, the desire to escape the daily grind and having to show up and clock on somewhere everyday? Some organisations and professions even have enforced retirement. But what if you love your work so much that it doesn’t feel like work?